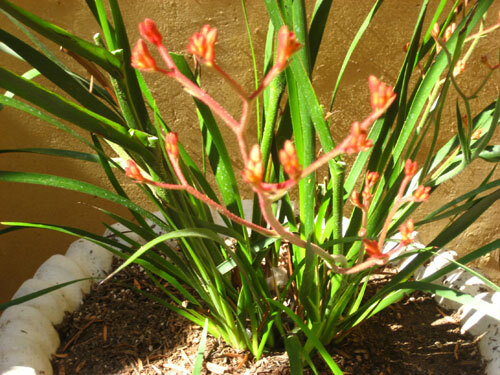 Pruning and maintaing Kangaroo paws, (Anigozanthos) is worth the effort because it is very simple to do and greatly improves the look and health of your plant. The native western Australian plant, "Kangaroo paws," ( Anigozanthos) seem to be everywhere these days. I see the evergreen, dark green clumps with striking tubular flowers in red, purple, green, orange and yellow displayed in pots, in garden beds and used in all kinds of landscape designs from tropical to contemporary. Kangaroo paws are in my garden too. Gardeners with sympathetic gardening zones that are dry, hot and mediterranean-like have discovered the almost-never-ending, vigourous performer contributes ceaseless color to the garden bed. So when a client calls me and tells me their Kangaroo paw is "dead," I don't worry, its usually just time for some careful grooming and pruning! While the dried flower stalks of the Kangaroo Paw look great in dry flower arrangements, I can understand the dismay my clients feel when they see formerly robust and vivid flowers turn pale and lifeless looking. No big deal- just follow the flower stalk to the base where it emergences from the foliage clump and snip it off. New flower stalks will be encouraged to grow and soon new flowers will emerge to replace the old. Remove any brown or ugly foliage straps while you are at it so that the newly pruned Kangaroo Paw looks neat and green. It never ceases to amaze me how many people "trim" brown tips from otherwise green strappy foliage, as if it will grow in where it was cut. Remove the entire strap from the bottom! Trimmed straps look terrible and they will stay ugly until the foliage dies back. After I trimmed the dead flower stalks and cleaned out the ugly foliage, I noticed new flower stalks waiting for their turn in the sun. With the which the extrenous foliage and dead flowers gone they should get plenty of light! New flower stalks are already emerging! Keep your Kangaroo paws moist (but not damp) during the new flowering period so that severe dryness will not prompt them to dormancy. Once the flowers get some height on them, cut the watering back and only water when the soil around the root ball feels dry. Kangaroo paws appreciate well draining soil, lots of sunshine and they are not good swimmers- so go light on the water. Kangaroo paws will reward you for your efforts with show-stopping blooms that will have your neighbors asking, "What plant is that?" I especially like to plant Kangaroo paws as an airy and translucent hedge. Take a look at it in my yard. 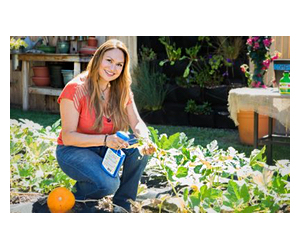 *See more garden projects, before and after landscape photos and the latest in garden design with regular visits to Shirley Bovshow™s EdenMaker™s Blog! Dottie, sorry to be the bearer of bad news. Kangaroo Paws are suceptible to “Ink Spot” disease. 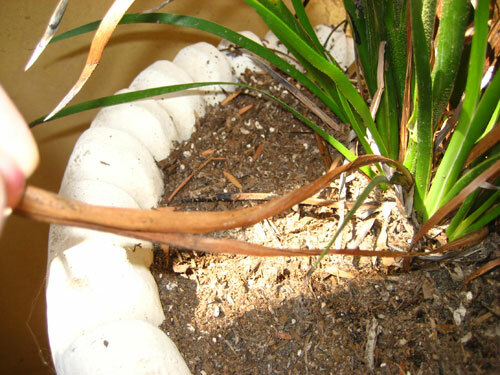 This is a fungus that starts in the leaves and trickles down to the roots, killing the plant. Once the kangaroo paw turns into a black stump, it is DEAD. Lack of air circulation, high humidity and too much water are the culprits. Unfortunatley, Kangaroo paws are vulnerable to a dark, sooty fungus called “Ink spot” disease. Usually due to overly humid conditions, poor drainage and lack of air circulation around the plant. Make sure the water at the root zone is actually percolating through the soil and not stagnant around the roots. I live in Southern California and use the drip system on my kangaroo paws (3 times a week/10 minuites) Most of the leaves have turned brown at the tips. The rest of the leaf is green. What could be the reason? Hi Shirley, I bought a beautiful Kangaroo plant at the biginning of Spring ( I Thought ) It would have normally, however in So.Texas we have had the wettest & darkest weather I have ever seen! Still going on! My Kangaroo has been to wet, and has slowly turned into a black stump! How hardy are these? will it come back? We are strting to get the "normal" hot days we are used to. i have joined your page hoping for some advice on my kangaroo paws ,i dont know if its me but i can not see a reply? i cant find my question ,i understand you are busy i just wanted to know if you have received it ? Did you consider changing the container to a lightweight one? Nothing better that a lightweight pot for portability. Even better, place a plant dolly underneath your current or future pot to move easily. When planting in a heavy or large pot, use a container insert (plastic board with drain holes that wedges itself halfways down your pot) so that you don’t have to fill your container all the way with soil. Will save your back. heavy pot – too heavy to move indoors. What can we do? I need to know when i bring my kangaroo paws in for the winter, do i need to trim them down or what? how long will it take for new flowers to form after Pruning? Shirley, thank you for this info. It’s very helpful. There is one other issue that we are dealing with. We recently transplanted two kangaroo paws because they got far too big for our pathway (we’re learning as we go). We moved them to our backyard garden and they looked amazing for about a week. Now they look like they aren’t going to make it. I’m going to follow your instructions above and cut it back, but in your experience, do they come back after a transfer? We did fertilize the soil in the hole and around the plant and kept it pretty moist for the first week. Thanks for any help you can provide. Welcome to EdenMakers! You pose a good question regarding toxicity of the Kagaroo Paw. I do not know if it is toxic to animals and was not able to find information about it.Sorry. Kangaroo plants are extremely drought tolerant though they appreciate some consistent light moisture during the blooming season. If the Kangaroo becomes too dry, it will most likely enter into a dormancy state so don’t allow that to happen while blooming. 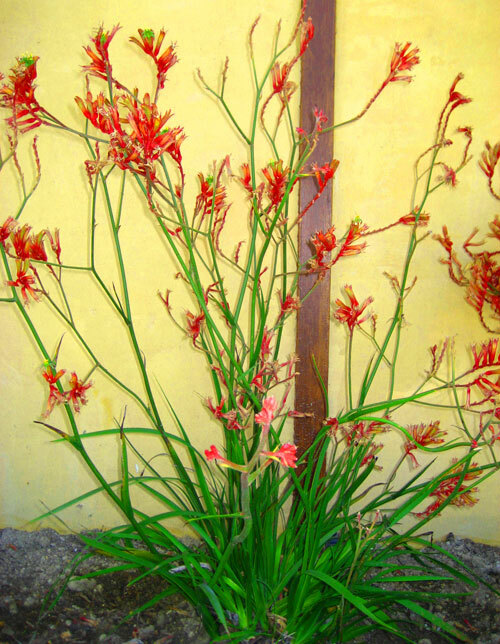 I just purchased the beautiful Kangaroo Paw, Big Red plant. I have two questions: 1 What is considered too dry a climate for the Kangaroo Paw? & 2 Are the Kangaroo Paw plants toxic to animals? Hi Marion, thanks for visiting. To add color to your garden bed where you have non-blooming Kangaroo paws, I would put in a plant whose height will not compete with the strappy foliage of the paw. That could be any colorful groundcover or even a mounding or tufted plant. I have my paws underplanted with yellow golden Sedum aurea- a plant that is an equal in water demand with the paw and that always has a natural color even when not in bloom. You can try verbena in the color of your choice or go with succulents like sennecio or other low water plants. Hope this helps. I have a mixutre of paws in a couple of my flower beds, and they have flowered really well this year. There are a few flower stalks left, and I have cut down all the dead ones…..my question is there is a lot of green foliage left, what do I do now, they still look good? Cut them down and if so, is there anything I can put in the beds while waiting for the kangaroo paws to return? Icilma and Shirley, so far as I can tell, deer will eat just about anything, whether “deer resistant” or not. I don’t have personal experience with kangaroo paw (it would freeze back here), but I know that deer find tasty the blooms of bulbine and yuccas, which seem somewhat similar. Boy, that top photo makes me want to give it a try though. Icilma, why not go for it with one plant in a pot that you can take inside when it freezes, and see what happens? I’m going to refer this question to landscape designer and fellow gardening coach Pam Penich who lives and works in Texas. I don’t know the answer. Check back for her answer. Anyone else out there who can answer this question is welcome to. I live in central Texas, do deer eat kangaro paw? In my experience, kangaroo paw leaves turn brown or black for two main reasons. 1. Too much water. 2.Frost damage. In either case, I would wait until spring and early summer are in full swing before removing the plant. It may surprise you with new green foliage growth like mine did! I have a Kangaroo Paw I purchased in late spring of last year. It did really well for a while and I an not recall when exactly but the leaves have turned brown and there is absolutely no green on the plant at all. I would like to hope it was when the weather turned cooler. At any rate, my paw is just a clump of brown. Will it come back? I live in Tucson Arizona and it is getting warmer here. The daytime temps are in the mid 70s and the overnight lows are in the 40s. I really look forward to your reply! I don’t want to dig it up if it will come back to life. Hi Randall, Cut those dried flower stalks off. I do and I get a nice new flush of flowers a few weeks later. That may be different for you since your pots are indoors and paws need sun and some heat to flower. If you like the look of dried flower stalks keep them on- I think they look good. I grow Paws in pot in a colder climate and bring them inside for the winter…is it a good idea to cut the flowering stalks out, or should they be left alone? Hey Debra! Welcome. Yes, it was an exciting balloon ride (although we just stayed in one place!) Thanks for your encouragement regarding my writing. Now, friends, if you want to read some fantastic material from a true writer, visit Debra’s web site at http://www.DebraPrinzing.com and look for her upcoming book on garden sheds in the garden! hi there, just had to browse your blog and see how cool it is . . . and how well it reads, my friend. You are a natural writer – don’t forget it! It’s a treat seeing your adorable smile on every page.